There are plenty of reasons anyone who cares about good food should explore Chloe, the debut restaurant from veteran Washington chef Haidar Karoum. Three of the most compelling arguments are Michel Richard, Gerard Pangaud and Nora Pouillon. Since Karoum, 44, launched his career in the District in 1994, he has worked for all three tastemakers. Consciously or not, the chef, who has also led the decidedly different kitchens at Proof, Estadio and Doi Moi, incorporated his mentors’ best practices and came up with a style of his own: global and delightful, a sweetly spare 105-seat dining room named for Karoum’s oldest niece. Be sure to order some oysters. They’re brushed with crème fraîche and horseradish, broiled just so and finished with crisp rye bread crumbs — just the sort of sound effect the late Richard would have signed off on at Citronelle in Georgetown, one of the most fascinating restaurants to ever grace the city. Make time for Chloe’s pâté, too. It’s a slab formed from duck liver and pork shoulder, with Bing cherries for a touch of sweetness and a mustard that packs a punch with charred scallions. Like so much of the food at the late Gerard’s Place downtown, the dish succeeds because there’s a reason for every ingredient and each plays off the other. In short, the pâté demonstrates good editing. Like to be shocked? Ask for the cobia crudo, raw slices of firm fish that fairly pulse with the help of lime juice, Thai chiles and fish sauce. The combination, freckled with puffed black rice and accessorized with fried shallots, is a go-to for Karoum and reminiscent of the work he produced during his tenure at Asia Nora in the West End. Chef Haidar Karoum works in the kitchen while diners (including at left, Nora Pouillon, Karoum’s former boss) sit at the counter. food. A guy can dream.) The menu at Chloe, a single sheet with nearly 30 lines in tiny font, has all the appeal of a grocery list, but believe me, you can pretty much point anywhere on the page and score something you would want to return for. Toast is enjoying Stormy Daniels-level attention right now, and Chloe is fueling the fashion with house-baked grilled bread lavished with creamy sheep’s milk ricotta, “really raw” honey, fresh rosemary and a drizzle of olive oil — basically a DIY open-faced cheese sandwich that sends your taste buds to summer camp. Gumbo might look out of place, but not when Karoum shares more of his résumé: While working decades ago at 219 restaurant in Old Town Alexandria, he fell hard for the seafood gumbo, his rendition of which at Chloe has my mind wandering to New Orleans for the duration of the bowl. Smashed fingerling potatoes look like a side dish waiting for an entree to come along, but that didn’t stop a companion and me from swabbing the spuds through a malty mayonnaise until all traces of the dish were gone. Karoum credits his Lebanese father with a few dishes, including one his dad was known to bring to potlucks: fried cauliflower tossed in tahini and lemon juice and garnished with pine nuts and fresh mint. It’s homely but exceptional, and I’ll fight anyone at the table for the last floret. Given the retreat of German restaurants, it’s a pleasure to see a Bavarian white sausage on the menu. The house-made link tastes of mace and coriander and arrives on a bed of squiggly spaetzle, a combination I loved when I first tried it here but on a recent visit tasted sweeter, possibly due to the white raisins in the dumplings. Another ongoing issue is the chicken spiced as if in Vietnam and presented with sticky rice and a rousing chile dip. It’s not the 30 minutes of cooking time that I object to, but the outcome: unevenly done chicken. Chloe employs ace hosts, respectful servers and others who think dropping by your table every other bite is a good idea. It’s not. More attention isn’t the same as mindful service, and when two diners are clearly huddled in conversation, the physical cue should be read as “do not disturb.” Plate-snatching is another concern here, partly due to insufficient table space for the multiple small plates diners are encouraged to try. The kitchen should take it as a compliment that some of us refuse to part with the last bite of cauliflower or cod. As it snowed in late March, Meyer lemon tart decorated with tufts of torched meringue and nuzzled with blueberry compote let me pretend it was warm outside. Hedonists should splurge on the wicked chocolate sundae that includes a warm brownie, although the chai panna cotta topped with spiced diced pears and nut brittle is plenty satisfying, too. Tyler Mitchell, they’re sure to become a hit, along with the very good banh mi, available with crisp tofu and mushrooms or with pork shoulder and pâté. Both sandwiches show up on bread that crackles, with carrot threads, cucumber slices and generous applications of mayonnaise. Trips around the world, the lunches are a steal at $10 each. Let’s hope they enjoy a long run. 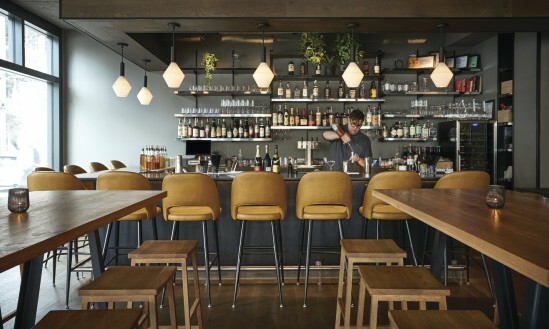 Like so much of Chloe’s menu, they make Washington a better place to eat, drink and be merry.